DCTI is a research initiative to improve beta-cell replacement therapy and to make this therapy accessible for more patients with diabetes. 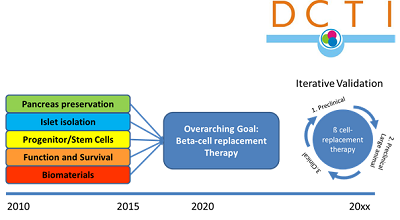 The main research goals are to increase the availability of high quality insulin-producing cells and the development of alternative transplantation sites and to identify factors for long-term islet function and survival with the use of biomaterials. Several DCTI partners have joined RegMed XB (www.regmedxb.com) to build on the knowledge generated within DCTI.